Connections to Catholicism run broad and deep in American society. One-in-five U.S. adults identify Catholicism as their religion. In addition, about one-in-ten are cultural Catholics – people who have a religion other than Catholicism, or no religion, but nevertheless think of themselves as Catholic or partially Catholic in other ways. A similar share of U.S. adults are ex-Catholics – people who were raised in the faith but no longer identify with it in any way. Still others are connected to Catholicism by virtue of having a Catholic spouse, a Catholic parent or through their attendance at Catholic Mass. All told, the new Pew Research Center survey finds, more than four-in-ten American adults are connected to Catholicism in one of these ways. This chapter explores these different types of connections to Catholicism. It also describes what being Catholic means to those who identify with Catholicism by virtue of their religion, their culture or their ancestry. One-in-five Americans identify Catholicism as their religion. But many more Americans have connections to Catholicism even though it is not their primary religious affiliation. Nearly one-in-ten adults (9%) qualify as “cultural Catholics.” When asked about their religion, they identify with a faith other than Catholicism (mainly Protestantism) or say they have no religious affiliation. But on a separate question, they say “yes” when asked if they currently consider themselves “Catholic or partially Catholic” in any way. 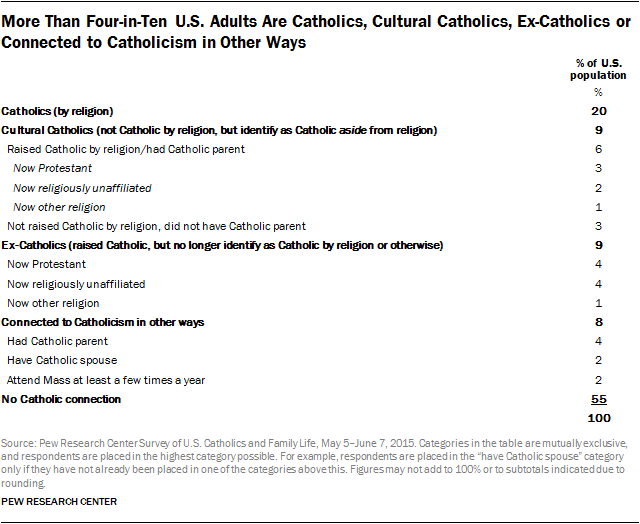 Most people in the cultural Catholic category (6% of all U.S. adults) were raised Catholic or had a Catholic parent, but some people in this group (3% of all U.S. adults) identify with Catholicism even though they are not Catholic by religion and were not raised Catholic. Another 9% of U.S. adults are ex-Catholics – people who say they were raised Catholic but no longer identify as Catholic either by religion or in other ways. This group is evenly divided between those who say they are now Protestant and those who say they are religiously unaffiliated. An additional 8% of U.S. adults are connected to Catholicism in other ways. This group includes people who say they had a Catholic parent (but that they were not raised Catholic) or have a Catholic spouse or partner. It also includes people who say they attend Mass at least a few times a year despite having no familial or personal ties to Catholicism. All told, fully 45% of American adults are connected to Catholicism in one of these four ways. Catholic connections run especially deep among U.S. Latinos. In the current survey, 45% of Latinos identify Catholicism as their religion.5 An additional 13% of Latinos are cultural Catholics, including 11% who were raised Catholic or had a Catholic parent. Nearly one-in-five Latinos in the U.S. are ex-Catholics, raised in the faith but no longer identifying with it (either by religion or otherwise). 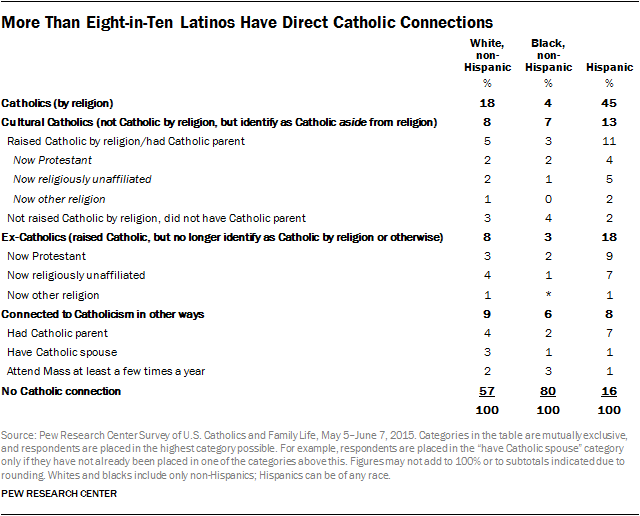 And an additional 8% of Latinos are connected to Catholicism in other ways, including non-Catholics who have a Catholic parent or spouse or say they attend Mass at least occasionally. Just 16% of Latinos in the U.S. have no connection to Catholicism as measured in the survey. There are fewer Catholics among younger adults than among older generational cohorts. 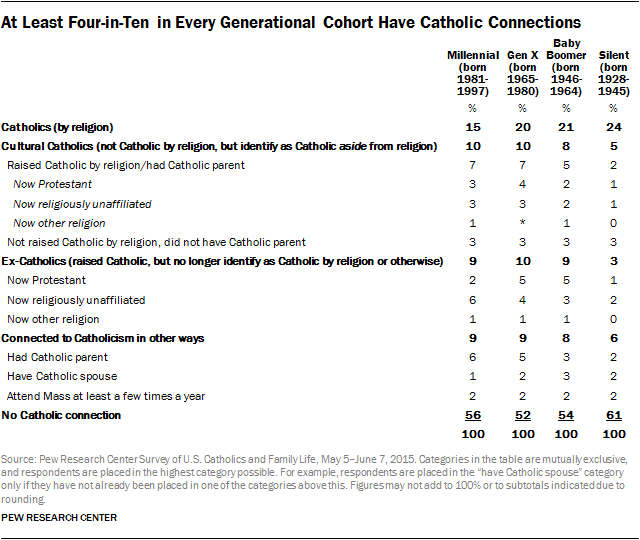 But substantial shares in every generational cohort have at least some identifiable connection to the Catholic Church. Among those in the Silent generation, nearly a quarter (24%) identify as Catholic. Only 3% of people in the Silent generation are ex-Catholics, compared with roughly one-in-ten Baby Boomers, Generation Xers and Millennials. Millennials are less likely than members of older generational cohorts to identify as Catholic by religion (15%). But nearly three-in-ten Millennials are cultural Catholics (10%), ex-Catholics (9%) or people with other kinds of Catholic connections (9%), comparable to the shares of Generation Xers and Baby Boomers in these categories. 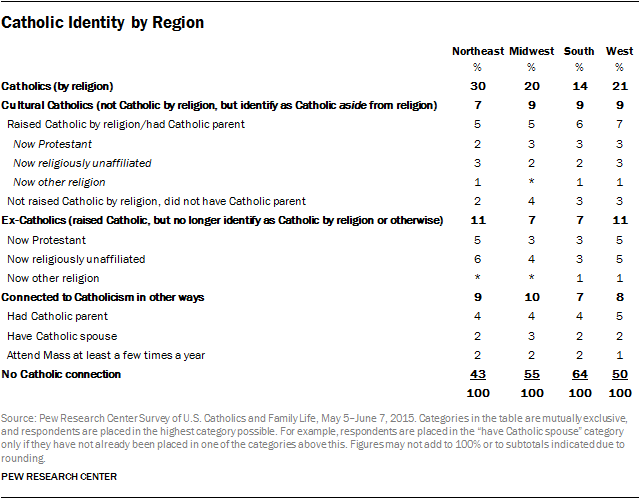 Catholic connections are especially common in the Northeast region, where more than half of adults are either Catholics (30%), cultural Catholics (7%), ex-Catholics (11%) or people with some other kind of connection to Catholicism (9%). About half of Westerners also have some form of connection to Catholicism, as do 45% of Americans in the Midwest. Catholic connectedness is least common in the South, where roughly a third of adults are Catholics (14%), cultural Catholics (9%), ex-Catholics (7%) or people connected to Catholicism in other ways (7%). In What Sense Are Cultural Catholics Catholic? Adults who are cultural Catholics – those whose primary religious identity is something other than Catholic but who nonetheless say they consider themselves Catholic or partially Catholic in some way – report a variety of reasons for their Catholic identity, including having a Catholic family background (43%), having an affinity for Catholicism (24%) and holding certain Catholic beliefs or participating in various Catholic rituals (12%). But there are important differences between cultural Catholics who were raised Catholic or had a Catholic parent and those without this family connection. 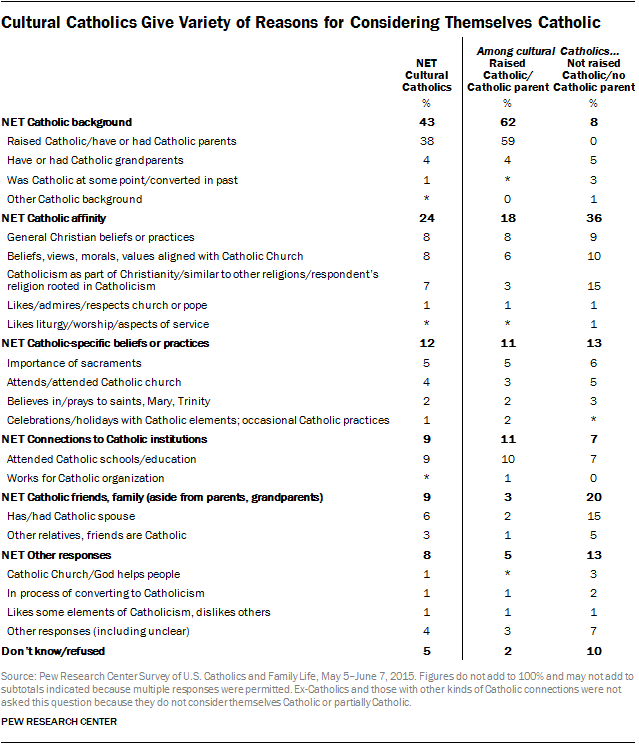 Among cultural Catholics who were raised Catholic or had a Catholic parent, a majority (62%) say they consider themselves Catholic today because of their Catholic background. By comparison, relatively few cultural Catholics (8%) who were not raised in the faith or did not have a Catholic parent cite having a Catholic background as the reason they consider themselves Catholic or partially Catholic. When asked why they consider themselves Catholic today, cultural Catholics who were not raised in the faith most often express a general affinity for Catholicism (36%). This includes 15% who see similarities or connections between their own faith and Catholicism, 10% who say their own values and morals align with those of the church and 9% who see themselves as Catholic by virtue of their Christian beliefs or practices (e.g., belief in God). One-in-five cultural Catholics who were not raised Catholic and do not have a Catholic parent say they consider themselves Catholic or partially Catholic because of their ties to Catholic friends or family members. This includes 15% who consider themselves Catholic because their spouse is Catholic and 5% who have Catholic friends or family members aside from parents, grandparents and spouses. About one-in-eight cultural Catholics who were not raised in the faith (13%) name participation in specific kinds of Catholic activities as the basis for their Catholic identity. This includes 6% who say the sacraments are important in their lives and 5% who say they attend or attended a Catholic church. Is Being Catholic Mainly a Matter of Religion, Culture or Ancestry? 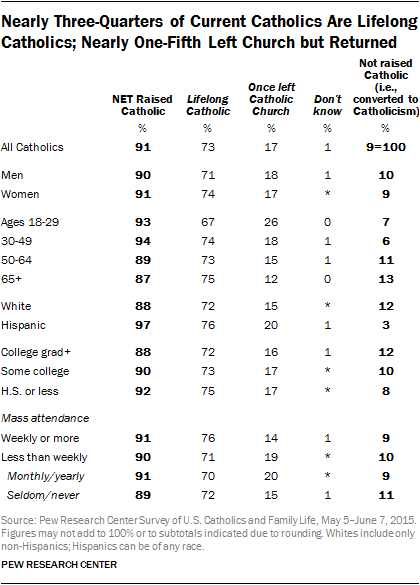 Roughly four-in-ten Catholics (38%) say they see being Catholic mainly as a matter of religion. An additional 8% say being Catholic is both a matter of religion and a matter of ancestry or culture; this includes those who volunteer that it is a matter of religion, ancestry and culture. But half of all Catholics (49%) appear to view the affiliation in a less spiritual manner, saying that being Catholic is mainly a matter of ancestry (28%), culture (21%) or both (1%). Those in the “cultural Catholics” category are more likely than Catholics by religion to say their Catholic identity is mainly a matter of ancestry or culture. But there are important differences on this question among cultural Catholics. Those who were raised Catholic or had a Catholic parent are twice as likely as those without this family background to say being Catholic is mainly a matter of ancestry (44% vs. 22%). “Cultural Catholics” not raised in the faith look much more like Catholics by religion on this question, with 38% saying that being Catholic is mainly a matter of religion. Two-thirds of Catholics say having a personal relationship with Jesus Christ (68%) and believing in his actual resurrection from the dead (67%) are essential to what being Catholic means to them personally. 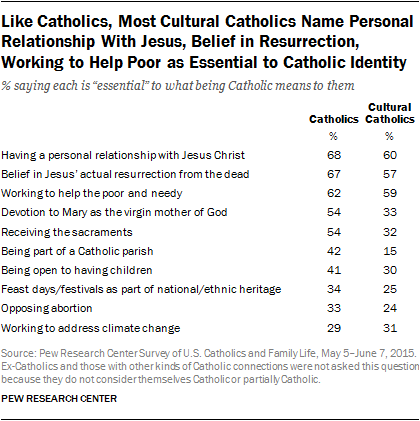 And nearly as many (62%) say working to help the poor and needy is an essential part of their Catholic identity. Smaller majorities of Catholics say devotion to Mary as the mother of God and receiving the sacraments are essential to what being Catholic means to them (54% each). About four-in-ten Catholics say being part of a Catholic parish (42%) and being open to having children (41%) are essential to their Catholicism, while roughly a third mention celebrating feast days and festivals that are part of their national or ethnic heritage (34%). A third or fewer say opposing abortion (33%) and working to address climate change (29%) are essential to what being Catholic means to them. 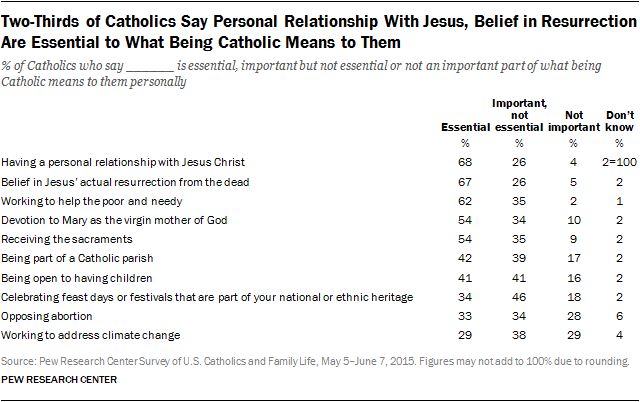 In general, cultural Catholics are less likely than Catholics by religion to describe various beliefs and practices as “essential” to what being Catholic means to them. But the elements of Catholicism that are most essential to Catholics – having a personal relationship with Jesus, belief in the Resurrection and working to help the poor and needy – also are those most commonly cited by cultural Catholics. Analysis of the survey findings shows that partisan leanings affect some elements of Catholic identity. For example, Catholic Democrats and political independents are more likely than Catholic Republicans to say that working to help the poor is essential to their Catholic identity; two-thirds of Catholic Democrats and independents say this, compared with 56% of Catholic Republicans. 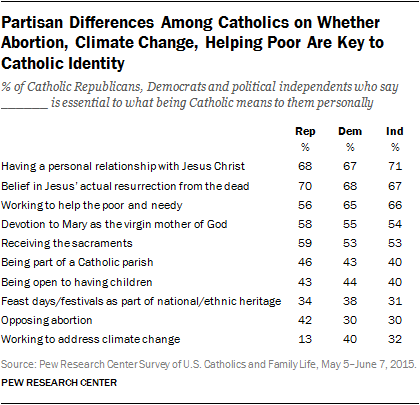 And working to address climate change is seen as an essential part of Catholicism by far more Catholic Democrats (40%) and independents (32%) than Republicans (13%). By contrast, opposition to abortion factors more prominently in Catholic Republicans’ sense of Catholic identity than it does for Catholic Democrats and independents. Four-in-ten Catholic Republicans (42%) say opposition to abortion is essential to what being Catholic means to them, compared with 30% of both Catholic Democrats and independents. Partisan differences are smaller on other questions about the things that are essential to people’s Catholic identity. Most Catholics are very loyal to the church. Fully seven-in-ten say they could never imagine leaving the church, no matter what, compared with 26% who say they could imagine doing so. More Catholic women than men say they could never leave Catholicism (75% vs. 64%). And older Catholics express more loyalty to the church than younger Catholics; 80% of Catholics ages 65 and older say they could never leave the church, compared with 70% of those between the ages of 30 and 64 and 56% of Catholic adults under age 30. But across most of these groups, more Catholics say they cannot envision leaving the church than say they could see themselves doing this someday. Despite this high degree of loyalty to the church among Catholic adults, other research has shown that many people who were raised Catholic ultimately do leave Catholicism behind. Pew Research Center’s 2014 Religious Landscape Study looked at the large pool of Americans who were raised Catholic, who represent approximately a third of the U.S. adult population, and found that fully 41% of adults who were raised Catholic no longer identify as such. The new study provides an opportunity to assess how many people who leave Catholicism ultimately wind up returning to the fold. The survey asked Catholics whether there ever was a time in their lives when they did not consider themselves Catholic. Among people who currently are Catholic, nearly one-in-five (17%) were raised Catholic and once left the faith before ultimately returning to it. Nearly three-quarters of Catholics are lifelong Catholics – cradle Catholics who never left the church. And about one-in-ten Catholics (9%) are converts to the faith. The survey also asked those who were raised Catholic but who are no longer Catholic whether they could see themselves returning to the church. Most (77%) say they do not envision doing this, while 19% say they could imagine returning to the faith one day. But there are big differences on this question between cultural Catholics and ex-Catholics. Among cultural Catholics who were raised in the faith, fully 43% say they could see themselves returning to the Catholic Church someday. By comparison, just 8% of ex-Catholics say they could imagine themselves returning to Catholicism. Roughly nine-in-ten ex-Catholics say they have left the church for good.